My gorgeous doberman girl has given birth to a litter of beautiful big chunky healthy pure bred Doberman puppies, boys and girls available, traditional black and tan, the puppies are not kc reg as they are family pets both parents can be seen as they are our family pets and have fabulous nature's with loyalty second to non, excellent around children. 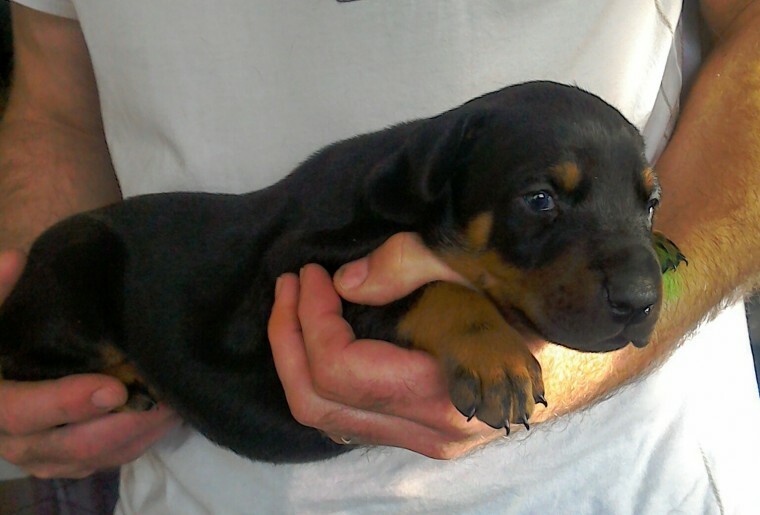 Mum is a beautiful deep chested German /American doberman girl with a fabulous kind gentle nature. Dad is a big strong Bulgarian /European doberman boy with an amazing loving nature. The puppies are being brought up in our loving family home with lots of care and attention, they will be used to all household noises, before the puppies leave at 8 weeks old for their new forever loving homes their first vaccination will be given, they will be wormed and flead regular, and given a full health check, micro chipped and will be toilet trained to go outside, the puppies are only 2 weeks and 5 days old as of today the 15 th March 2018. Viewing is very welcome, if you are genuinely interested a deposit holds a puppy of your choice.